In the second book in the Hello Little Owl series, Little Owl has learned to fly! Butterfly temps her to fly to the beach and her friend caterpillar comes along for the ride. As they fly over the beach and ocean they see many magical things. They land and make friends with Hermit Crab who teaches them a new game. Their adventure at the beach becomes an unforgettable life lesson as Little Owl gets in trouble. Mother Sea Turtle must come to the rescue and take Little Owl and her friends back to their home in the forest. 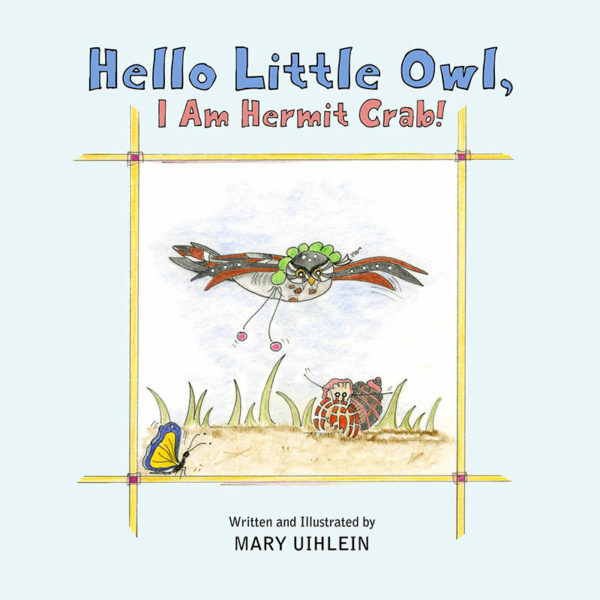 Hello Little Owl, I am Hermit Crab! is a story that teaches the life lessons of listening to the wisdom of Mommy and Daddy Owl and never wander off on a new adventure without telling your parents where you are going. This is a story you will want to read with your child and enjoy many times. Here is a sneak peek of the voices and sound effects that are in the audiobook.